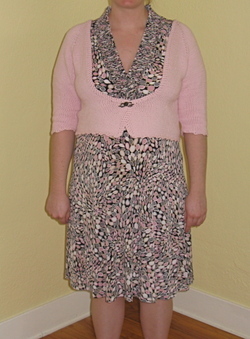 Pattern: Cropped Cardigan with Leaf Ties from Fitted Knits. Yarn: Lion Brand Cotton Ease in Strawberry Pink (3 skeins). Needles: Addi Turbos Circs US7s. Alterations: I shortened the length by two inches. 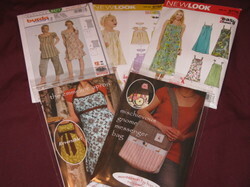 This was simply to make the garment wearable during my pregnancy. I didn't want it to stretch around the belly and look ridiculous. After a bit of consultation, I also crocheted the edges along the neck and front, instead of making the icord ties and the attached icord edging. Again, I am extremely happy with how this look turned out. Impressions: I really like this cardi. I received quite a number on compliments on it at work. It is the perfect piece for spring, and pairs perfectly with the growing belly. 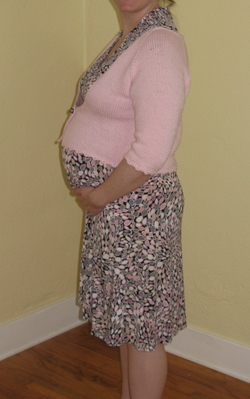 Speaking of belly, you just know you want to see the most recent belly shot, don't you?? 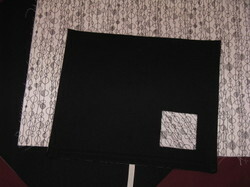 This is the beginning stages of the Swallowtail Shawl from IK Fall 2006. I'm using the Brooks Farm Acero I picked up at Stitches West a little over a week ago. Due to the weight change in yarn from that of the pattern, I opted to increase the needle size to US6s. 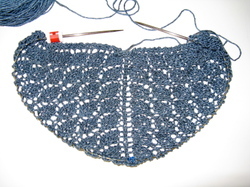 So far I've completed six repeats of fourteen for the second lace chart. Thus far I am really enjoying the knitting on this! 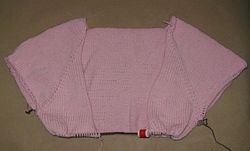 #5 - The tribal sweater is finished. I hope to have the FO post for tomorrow!